The site of the wreck, which rescue workers stressed was "not at all humorous in any way." 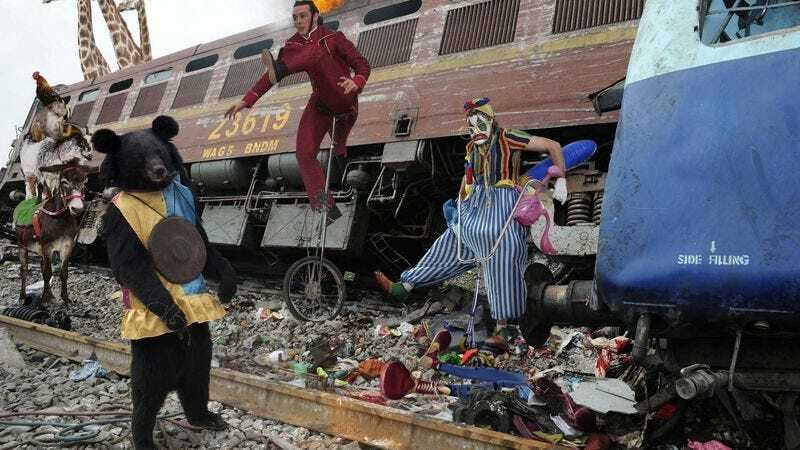 ALTOONA, PA—Following the fiery derailment of a 56-car Ringling Bros. circus train Wednesday, hundreds of clowns, somersaulting acrobats, ringmasters on stilts, stampeding giraffes, and monkeys in colorful hats were seen fleeing the accident, which investigators stressed was a very serious matter and in no way funny. According to officials, at least 13 circus performers have died, with dozens more suffering severe burns as a fire spread through the mile-long train, eventually igniting a fuse that launched a human cannonball 200 feet above the devastating and not-at-all amusing scene. "Train wrecks are never a laughing matter, and this one is no exception," police chief Jeffrey Phelps said as several rainbow-striped balls, hula hoops, and half a dozen zebras tumbled from an upended train car behind him. "I personally witnessed three clowns in full makeup yelping and trying to outrun the blaze as they paused to hitch up their bulky oversized trousers and tripped over their big floppy shoes—it was horribly tragic." A completely unamused firefighter attends to one of the wreck's numerous injured. "In fact, there's nothing at all here that would put a smile on anyone's face," Phelps continued. "Not the sight of those unicyclists juggling a series of burning objects in an effort to keep them from reaching the engine's fuel tank, and certainly not the spectacular feat of a fire-eater then expertly swallowing each of those flames. He is now in critical condition." Among other things the police described as not being humorous were three elephants wearing large red neckties with matching vests feeding from a smashed-open peanut supply container, a cavalcade of contortionists extracting themselves through the tiny opening of a crushed dining car, and a group of dwarves bouncing up and down on a trampoline in an attempt to rescue a bearded woman who had been thrown from the train and was hanging from a tree branch in which her facial hair had become entangled. A parade of elephants in which each animal uses its trunk to hold the tail of the one in front of it is not cute when those elephants are dying of smoke inhalation, authorities added. "I can see how you might initially find some sort of potential for amusement in juggling pins rolling down a steep embankment while miniature ponies frolic below," emergency management coordinator Mario Sanchez said without a hint of smile. "But after those ponies reared back on their hind legs and pranced atop the pins for 10 or 20 wobbly yards, most lost their footing, shattered their forelimbs, and had to be put down." Added Sanchez, "And it was a matter of grave seriousness for all involved when that poor Russian bear was forced to jump on a tiny tricycle so it could pedal to safety." Explaining to reporters that crews were working to clear the scene as quickly as possible, Sanchez emphasized that no emergency personnel were seen stifling laughter as they treated the circus's strong man, who suffered a hernia while trying to lift an overturned passenger coach that was crushing a lion tamer. Other straight-faced sources confirmed none of the accident's sights and sounds were even remotely entertaining, from the spectacular fireworks launching every few minutes to the whimsical strains of carnival music echoing endlessly through the night as a result of smoke billowing through a steam calliope. "This has been a horrific day, one we may never recover from, but I did see one small beacon of hope amidst the tragedy," said Charles Simon, an animal trainer with Ringling Bros. "I watched as a baby tiger, just a tiny little guy, leapt to safety through a boxcar door completely engulfed in flames." "And usually it takes years of repeated, systematic beatings before you can condition an animal to do something like that," Simon added.